Miami Heat shooting guard Dwyane Wade may be 36 years old, but he’s still got plenty left in the tank. 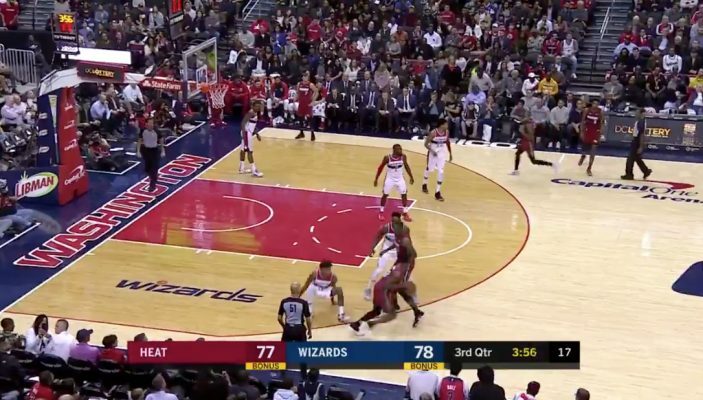 That was evident on Thursday night as he dropped forward Kelly Oubre Jr. of the Washington Wizards with a crafty spin move. Father Prime is still dropping dimes and making dudes fall. He proceeded to find Rodney McGruder under the basket for the easy bucket. The three-time NBA champion started the season off with nine points and 11 rebounds in a loss to the Orlando Magic. Wade and the Heat will look to redeem themselves with a victory against the Washington Wizards on Thursday night.